That Music Always Round Me consists of thousands of ink and brush drawings cut out and glued together. 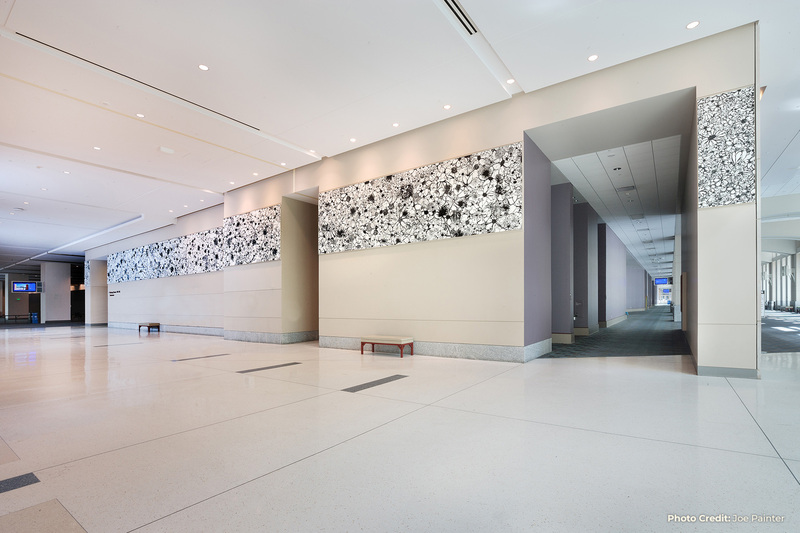 A site-specific commission, this 100-foot-long collage functions as an architectural frieze in the contemporary space of the Convention Center. 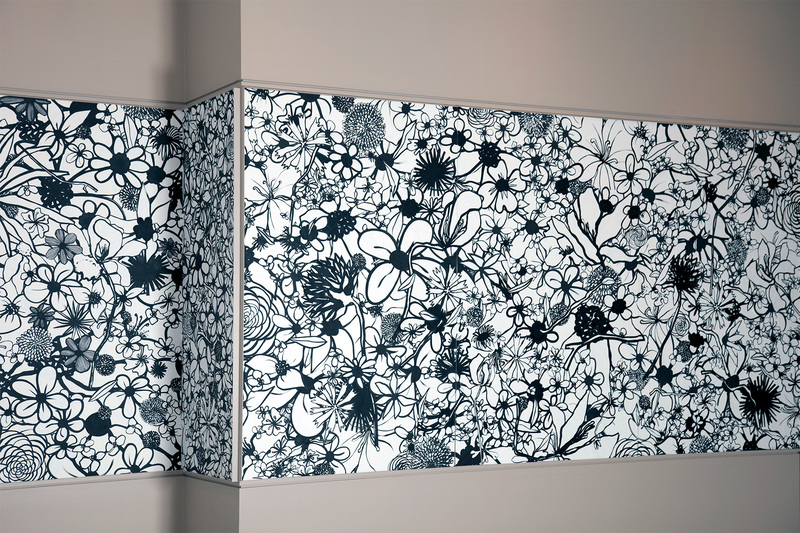 Bowlby took inspiration from the decorative motifs across Broad Street in the Pennsylvania Academy of the Fine Arts, where she received her graduate degree in 1996. Primarily the work of architect Frank Furness, that building was completed in 1876 and designated a National Historic Landmark in 1975. An avid gardener and reader, Bowlby used many different resources to develop her imagery. She drew from observation in her own garden as well as from collected and dried plant material. 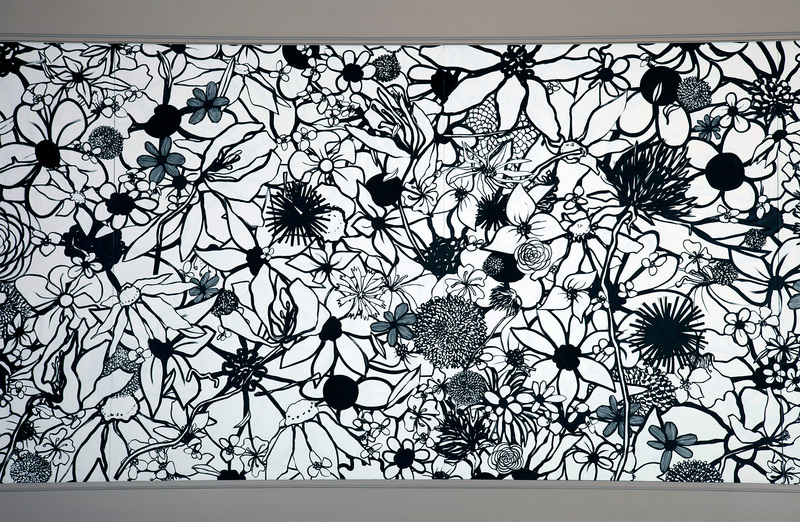 She used contemporary research tools such as Pinterest to gather visual information on fabric and wallpaper design, garden design, and how other artists use floral motifs in their work. She also referred to books on botany, plant identification, and botanical illustration. Plant growth in a riotous garden seems a fitting metaphor for city life. There is so much energy in an urban space, caused by both conviviality and conflict and circumscribed by the sheer variety of different kinds of people and architectural styles. This mash up, emblematic of city energy, is present in Bowlby’s work as a hybrid of stylized floral symbols and observed life drawings mingling in and around each other like participants at a parade. That Music Always Round Me is the title of a poem by Walt Whitman published in the ‘Whispers of Heavenly Death’ section in his final edition of Leaves of Grass (1891-1892). Whitman composed and updated this seminal work throughout his life. He died in 1892 and is buried in Harleigh Cemetery across the Delaware River in Camden, NJ. The poem evokes a beautiful, layered chorus of celestial voices. Bowlby felt the framework of this poem and its title suited the contrast of a melodic ink line with the staccato of a floral emblem, as well as the possibility of cacophony resolving into clarity embodied in her project.